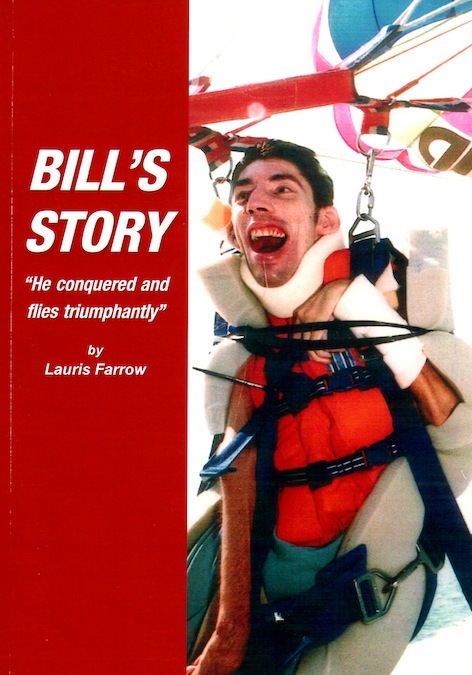 "He conquered and flies triumphantly" – “BILL’S STORY” is an extraordinarily powerful story of a mother's love and a child's courage. Chronicle of the author's second son’s life, an intelligent and resilient child who, after suffering a series of three catastrophic episodes to the brain in early childhood was permanently robbed of speech and movement, of full health and potential. During this time he had ‘triple antigen’ injections at the age of three, four and six months, as well as the Salk vaccine, given by the 'Flying Doctor' team. After each he was very miserable and I remember once walking him around 'the flat' (the barren outdoors) during the night because he was so irritable and crying. I had heard other mothers say they had had this same experience, and had been told by doctors, 'Oh, that's all right'. This was twenty years ago, and I doubt whether it was known then that brain damage could follow. Or perhaps it was not told to the general public for fear people would not have their children immunized. It is now well documented that a very small percentage of children do suffer brain damage. However, the number of children saved by these immunizations far outnumber the ones who suffer. The few sufferers pay that most terrible price.